Pinata Hunter is a cool interactive game in which you will have to see how the kids enjoy themselves at a birthday party. 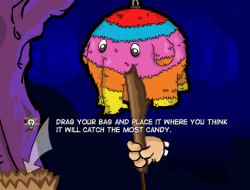 Keep in mind that the pinata will be quite hard to crack open but with each hit you nail some candy will be falling out of it. Depending on the angle of your hits you will have to move the bag around and try to place it in a spot where most of the candy falls out. Have a fun time upgrading your stick and loads more bonuses that you can afford. Use the mouse to hit the pinata. Pinata Hunter 0.00 between 0 and 10 based on 0 votes.